I haven't been feeling very well today, so all I got made is this one very simple card. 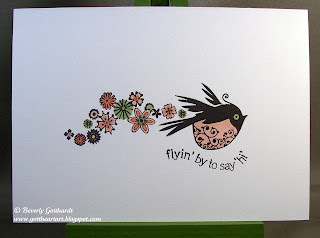 I've always loved this little birdy stamp, seems like a Happy Fellow. Some black ink, 2 stamps, 3 markers, a white card blank, an envelope, and a 42 cent stamp, a very easy way to stay in touch with a friend. Aw, I hope that you feel better soon. Gorgeous bird image, so sweet with the trail of flowers behind it! What a fabulous image, so cheerful! This is a sweet little card...I hope you feel better so you can stamp some more of these! It IS a nice way to stay in touch! Thanks for playing with my Paper Player colors this week! This little birdie is so sweet! Lovely LIM and anyone would love to receive this card! Hope you are feeling better today! What a sweet image - love this fabulous card. What a fabulous image and superb card! What a funny card. Great work. Such a cute image - wonderful CAS card! hope you are feeling better! Thanks for playing along with the Bloggers Challenge! What a sweet little birdie! I hope it made you feel a little better to bring him to life on this sweet little card! Hope you feel better soon...Thank you for playing along with us at The Paper Players!